On March 15, a Muslim-hating gunman supposedly livestreamed his mass murder spree at a Christchurch, New Zealand mosque. But a day later, governments around the world–in virtual total collusion with “private sector” companies such as Google, Facebook, Instagram, Youtube and Twitter–have banned all postings of any video or any portions of it other than government-approved imagery. 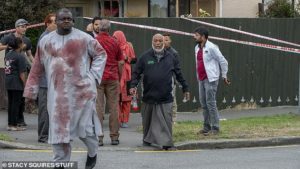 New Zealand authorities threatened citizens that they face up to 10 years in prison for “knowingly” possessing a copy of the New Zealand mosque shooting video – and up to 14 years in prison for sharing it. Corporations (such as web hosts) face an additional $200,000 ($137,000 US) fine under the same law. See here. Many people who saw the “live stream” video taken by the alleged gunman report that the video appears laughably fake and staged. Perhaps consequently, almost all imagery attached to news content about the story consists of nothing but images of police response as of March 18. Many commentators report that the ‘bloody guy walking around’ is reminiscent of the children walking around in circles for the cameras during the 2012 Sandy Hook event. New Zealand government officials immediately announced more gun control for the people of New Zealand.